The site has changed several times now, to reflect the transition from Pope Benedict to Sede Vacante and now to Pope Francis. For anyone interested in a tiny tidbit of history, you can see what it used to look like here. Categories: Catholic culture, Church History, internet, Pope Francis, The Church | Tags: conclave, habemus papam, interregnum, news the pope, papacy, Pope Benedict XVI, Pope Francis, sede vacante, vatican | Permalink. 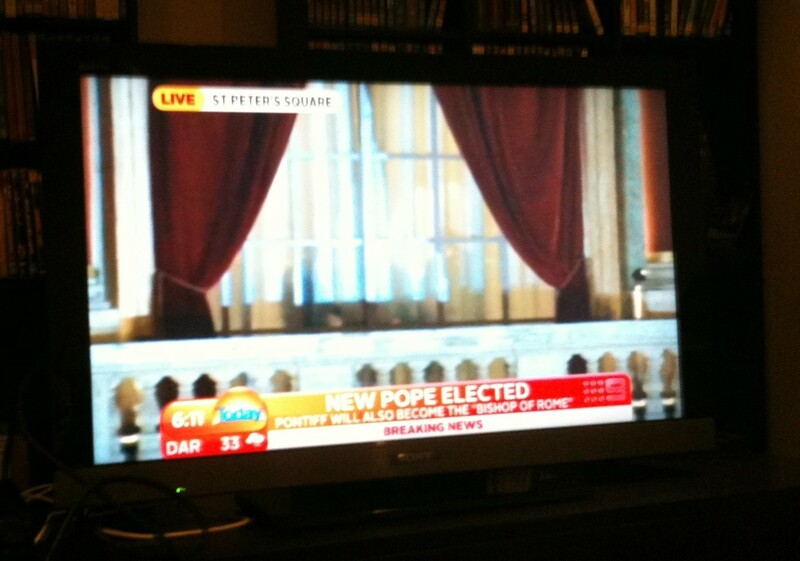 Here is the coverage from white smoke through to the end of the Pope’s address. The white smoke is in the first minute. Once you have seen some of the coverage of the crowds, you may wish to skip through to the Habemus Papam announcement at 1 hour and 7 minutes. Pope Francis’ first appearance and address starts at 1 hour and 16 minutes. Blessed be God for the gift of this humble, prayerful shepherd. The world is grateful for his generous “yes”, that he would wear the shoes of the Fisherman, that he would serve the Lord by becoming father of the faithful. Pope Francis, we pray for you as you have asked us to do. May you always cling to the Cross of our Saviour. May He be with you always. Categories: Church History, conclave, internet, pope, Pope Francis, The Church | Tags: coverage of new pope announcement, habemus papam, papacy, pope, Pope Francis, pope francis wikipedia, shoes of the fisherman | Permalink. 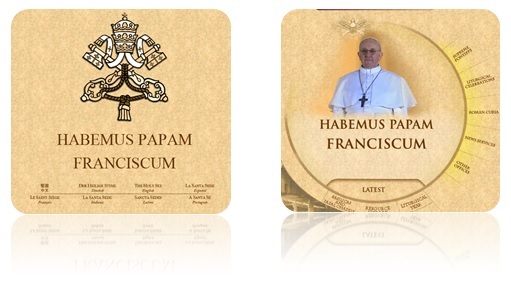 Habemus Papam!! Standing by to see who it is! Blessed be God in all His gifts!! UPDATE: Go here to see the coverage of this historic event from the white smoke all the way through to the end of Pope Francis’ first appearance on the balcony! Categories: Church History, conclave, internet, pope, Pope Francis | Tags: conclave, habemus papam, papacy | Permalink.